Gleick is a member of the National Academy of Sciences and the International Water Academy. In 2001, he was named a “visionary on the environment” by the BBC. He is the president and co-founder of the Pacific Institute, a nonprofit environmental research institute, where he researches the connections between climate change and water use. —A flyer touting the stock of a Texas bottled water company. When we’re done, tap water will be relegated to showers and washing dishes. —Susan Wellington, president of the Quaker Oats Company’s United States beverage division. September 15, 2007, was a big day for the alumni, family, and fans of the University of Central Florida and the UCF Knights football team. After years of waiting and hoping, the University of Central Florida had finally built their own football stadium — the new Bright House Networks arena. Under clear skies, and with temperatures nearing 100 degrees, a sell-out crowd of 45,622 was on hand to watch the first-ever real UCF home game against the Texas Longhorns, a national powerhouse. “I never thought we’d see this, but we sure are proud to have a stadium on campus,” said UCF alumnus and Knight fan Tim Ball as he and his family tailgated in the parking lot before the game. And in an exciting, three-hour back-and-forth contest, the UCF Knights almost pulled off an upset before losing in the final minutes 35 to 32. Water fountains used to be everywhere, but they have slowly disappeared as public water is increasingly pushed out in favor of private control and profit. Water fountains have become an anachronism, or even a liability, a symbol of the days when homes didn’t have taps and bottled water wasn’t available from every convenience store and corner concession stand. In our health-conscious society, we’re afraid that public fountains, and our tap water in general, are sources of contamination and contagion. It used to be the exact opposite — in the 1800s, when our cities lacked widespread access to safe water, there were major movements to build free public water fountains throughout America and Europe. three years after the Exhibition, thousands of Londoners would die in the third massive cholera outbreak to hit the city since 1800. The growth of the bottled water industry is a story about twenty-first-century controversies and contradictions: poverty versus glitterati; perception versus reality; private gain versus public loss. Today people visit luxury water “bars” stocked with bottles of water shipped in from every corner of the world. Water “sommeliers” at fancy restaurants push premium bottled water to satisfy demand and boost profits. Airport travelers have no choice but to buy bottled water at exorbitant prices because their own personal water is considered a security risk. Celebrities tout their current favorite brands of bottled water to fans. People with too much money and too little sense pay $50 or more for plain water in a fancy glass bottle covered in fake gems, or for “premium” water supposedly bottled in some exotic place or treated with some magical process. Americans now drink more bottled water than milk or beer — in fact, the average American is now drinking around 30 gallons, or 115 liters, of bottled water each year, most of it from single-serving plastic containers. Bottled water has become so ubiquitous that it’s hard to remember that it hasn’t always been here. As I write this sentence I’m sitting in the cafe in the basement of the capitol building in Sacramento, California, and all I have to do is lift my eyes from my computer screen — right in front of me are vending machines selling both Dasani and Aquafina. Yet, like UCF football fans, I can’t tell you where the nearest water fountain is. How do you convince consumers to buy something that is essentially the same as a far cheaper and more easily accessible alternative? You promote perceived advantages of your product, and you emphasize the flaws in your competitor’s product. For water bottlers this means selling safety, style, and convenience, and playing on consumer’s fears. Fear is an effective tool. Especially fear of sickness and of invisible contamination. If we can be made to fear our tap water, the market for bottled water skyrockets. Bottled water consumption is good, the industry argues, because the growth of bottled water sales has come not at the expense of tap water, but of other beverages. king less tap water? The U.S. Department of Commerce collects and publishes excellent data on beverage consumption. Contrary to what the bottled water industry argues, the numbers show that we are buying more bottled water and carbonated soft drinks, and drinking less of everything else, including milk, coffee, tea, fruit juices, beer, wine, hard alcohol, and especially tap water. Indeed, between 1980 and 2006, data on beverage consumption reveals that on average, each of us is actually drinking around 36 gallons per year less tap water now. With what have we replaced this water? Soda and bottled water. Over this same period of time, our consumption of carbonated soft drinks has grown by 17 gallons per person per year, our consumption of bottled water has grown by 25 gallons per person per year, and our purchases of all other beverages, including milk, juices, beer, tea, coffee, and hard liquor have dropped by 6 gallons per year. The beverage companies are winning the war on tap water. As long as people can be made to fear tap water, they will seek out alternatives they think offer more safety. But we have to ask: is bottled water actually any safer? What do we know about what’s actually in our tap water — or in the bottles of water we buy? And how safe is it to drink? 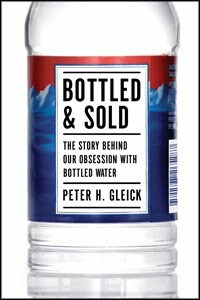 From Bottled and Sold: The Story Behind Our Obsession with Bottled Water by Peter H. Gleick. Copyright 2010 by Island Press.